Russian start-up is developing mass-market 3-D films to bring science into the classroom. EnterIdeas, a Novosibirsk-based start-up, wants to change the market for interactive educational technologies. The firm, which was a finalist in the 2014 Russian Startup Rating 2014, produces 3-D software that uses spherical image technology to project content around the user. 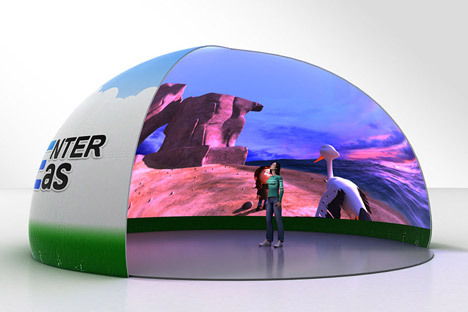 The content is used on fulldome immersive dome-based video projection systems. When EnterIdeas was founded in April 2013, there was only one company occupying Russia's fulldome market – SPACEGATE Nova, which produces content for planetariums. The kinds of films produced by SPACEGATE Nova and shown in planetariums can cost as much as $50,000. The films for the mass-consumer market segment targeted by EnterIdeas, however, can be made for as little as $10,000 and, thanks to compression technology, can be offered to end users for $7. "If big name companies are making systems that cost 100 million rubles ($2.8 million), we create a system whose turnkey cost for the end user is $10,000," said EnterIdeas CEO Igor Mendzebrovsky. "Moreover, we are trying to develop interactive content. Currently, video content for spherical screens consists of 20 or 25-minute films. We want a teacher, who, let's say, is viewing the video in a classroom, to be able to interact with the content with the help of an iPad remote control and therefore get the audience involved. These will be special programs or games, something radically different from what there is now." Currently, there are about 60 producers of fulldome content globally, and about 400 films have been made in this format. EnterIdeas has already made seven films and 11 more are being translated to English and will soon be released. EnterIdeas produced content in a range of educational fields, including geography, chemistry, physics, astronomy, biology targeted at different age groups. Additionally, EnterIdeas products feature a new DRM toolkit that protects the content of foreign distributors. Other key features of the system include a full HD signal that can be transmitted via Wi-Fi. The visualization system itself is also very compact, making it suitable for use in schools. In fact, EnterIdeas' main clients are individual entrepreneurs who show the films in schools and kindergartens. The company has also received offers to develop sales networks in the United States, the UK and other European countries. By the end of 2014, EnterIdeas plans to set up 120 installations; 29 preorders have already been completed. Some educators worry that projects like EnterIdeas value form over function. "I, personally, am somewhat afraid that this spectacle will make our schools, which already lack professionalism, a place of entertainment and not enlightenment,” said Moscow State University physics professor Vladimir Sudrin. Another Moscow State professor, Anatoly Zasov, also expressed concern about the system, but took a more balanced view of educational technology. "Does the show aspect outweigh the educational content?" Zasov said. "Of course. But I think that these facilities should combine these elements, therefore it is something that concerns the planetariums. There are programs in which the show is the most important thing, and there are programs that are dedicated to the firsthand scientific information.” However, Zasov added that EnterIdeas is a “very good example” of the way that educational technology platforms should develop. Yelena Bezrukova, director of the Business Development Section of the System Integration Department at Russian audiovisual production firm AUVIX is positive about the potential for EnterIdeas. "In my opinion, EnterIdeas has found an underdeveloped niche among private companies in Russia and the CIS countries," Bezrukova said. "They have also provided some fresh solutions. I doubt that the image transmission and content protection technology itself will help them occupy a significant share of the fulldome visualization market, which has already started using such technology. However, it is a working business model."